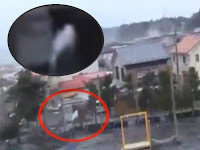 Very strange footage from the recent Japan tsunami, which seems to show a white humanoid looking figure rise from the waves. Figure is filmed leaping from the torrent, and then it climbs a building before vanishing. Could this be a ghost or possibly an alien creature of some kind. Whatever it is, its very strange. Compressed gas cylinder exploding under the water? Ok if you say so.. Not convinced this is anything out of this world. But, you probably no better than I? Could be a chameleon type creature that can camouflage to its environment. Its pretty big whatever it is. When it gets to the rooftop it appears to camouflage again. Whatever it is i wouldn't want to meet it face to face. It does look like some type of exploding air/gas in that clip!